Hotter and drier than the rest of Kauai, the western shore has a “frontier” charm all its own and miles of white sand beaches. For a special treat, plan a stop at Barking Sands Beach in the Pacific Missile Range Facility just west of Kekaha. This long sandy beach is often open to the public. Just show a driver’s license and auto insurance at the gate to get a day’s pass for $25. Hawaii’s Polihale State Park is adjacent to Barking Sands and literally at the end of the road. In fact to get there you must traverse the last few miles on a bumpy cane road. Those who make the trek are rewarded with dramatic vistas, breathtaking Kauai sunsets and enough beach for everyone to have their own private picnic. Park bathrooms and showers are available, as are some cabanas with barbecues. Should your sunset picnic carry over into early twilight, you can lay back and enjoy nature’s light show. The lack of streetlights make the area perfect for some amateur astronomy. Watching the stars gather while the moon rises over Polihale is a memory that you won’t soon forget. Being located miles away from towns and electric lights, Polihale is a great place to see the stars like you’ve never seen them before. It is a true thrill to view the billions of stars that emerge soon after sunset on one of Kauai’s beaches. Eventually, as eyes adjust, one realizes even the spaces between the stars have stars further in the background. Read more about Kauai's great beaches! 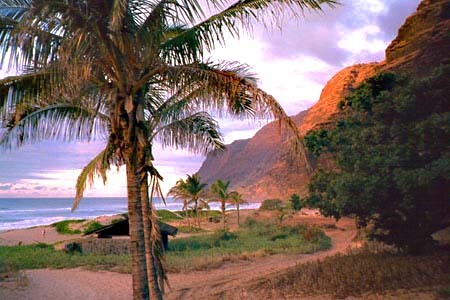 View a map of Kauai, Hawaii, which has links to other Kauai attractions and Suite Paradise’s Kauai vacation rental accommodations.